NEXTDC has joined forces with Melbourne Renewable Energy Project (MREP) group to source energy from a new 80MW wind farm in Victoria. The group includes a number of universities, cultural institutions, corporations and Councils that have signed up to the wind farm that will be built near Ararat in regional Victoria by Pacific Hydro. The Melbourne Renewable Energy Project (MREP) group plans to purchase 88GWh of energy from the wind farm, which is enough to power more than 17,000 households in Melbourne for a year. City of Melbourne Deputy Lord Mayor Arron Wood said, "This will abate more than 96,000 tonnes of greenhouse gas emissions from entering the atmosphere each year. That's as much as taking more than 22,000 cars off the road." The wind farm has received all relevant planning approvals: construction contracts are being finalised and are subject to financial close. 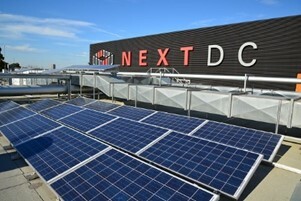 “Sustainability is a critical part of our focus on future growth,” said Simon, “which all began with our industry-leading investment in the 400kW rooftop solar array that resides on our M1 data centre in Port Melbourne, and which has been delivering around 500MWh of renewable electricity annually for several years now."